When it comes to wage gains, U.S. workers are increasingly playing the role of David to a corporate Goliath. 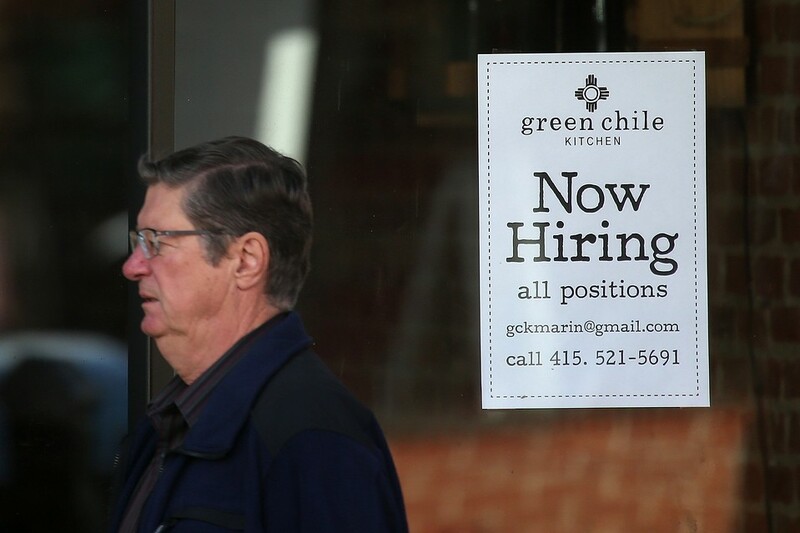 Hiring has picked up and the unemployment rate has fallen sharply over the past year. But for reasons that economists and policy makers are struggling to understand, wages have continued growing by only about 2% annually. This indicates that, despite a labor market that is clearly tightening, companies don’t have to pay up to attract workers. One possible reason: U.S. companies are getting bigger. And that means workers have fewer employers to pick from. New figures from the Labor Department on Wednesday showed that as of the first quarter, businesses with 500 or more employees counted 46.3% of U.S. private-sector workers on their payrolls. A decade ago this was at 44.2%. Most of the increase came at the expense of businesses with fewer than 50 employees. Those saw their share of employment slip to 28.4% from 30.2% over the same period. The expanded presence of large companies in the job market amounts to decreased competition for workers, points out Ben Herzon of economic forecasting firm Macroeconomic Advisers. For a rough analogy, think of a town with a few hardware stores, a couple of appliance stores and a lumberyard. Those businesses all, to some degree, compete for workers. But if a Home Depot opens and those other retailers close, people in the town will have fewer employment options and won’t be as able to demand higher wages as a result. Something like that may be happening across the entire economy as small firms represent a smaller share of employment. And that drop in small-firm employment owes a lot to a decline in startup activity. The decline in startup activity has come about as many traditional sources of funding for new firms have dried up. Banks are still hesitant to loan to new businesses; for many people, mortgaging the house for funding is no longer an option. What’s going on in Silicon Valley may seem heated, but angel investors, who put money in early-stage firms, have yet to fund companies like they did before the recession. They invested $10.1 billion in the first half of this year, according to the Center for Venture Research at the University of New Hampshire, compared with $11.9 billion in the first half of 2007. The handful of rapidly growing startups that go on to become very large have long been seen as a key to U.S. job growth. But competition for workers from the many smaller successes, from corner dry cleaners to tiny accounting firms, are also important. Without more of them, the labor market may need to get far tighter than it used to for wages to really heat up.